Pakistan has been producing some fine rugs for some time now (also some not so fine ones). When they copy designs typically found in Iran, very often they are called "Pak-Persians" or "Pako-Persians" to indicate that fact. I recently received just such a rug, pictured, and found it to be both very well made and tastefully done. The colors are all muted, with the field (background) color a rose-madder with a pinkish tone, rather than red. It was sold to me as an 18/20 line rug, which means that nominally there are 360 knots to a square inch. 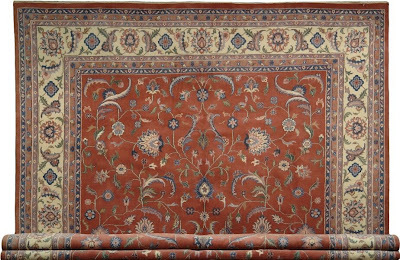 This allows for intriquecy of pattern that cannot be found in rugs with few KPSI (knots per square inch) The vendor claims that the weavers used imported New Zealend wool, and I can believe it as it is extremely soft, and there is a consistancy of color throughout this beautiful piece. Why purchase such a rug? Cost savings over similar Persians can be substantial. This rug, 14ft. 5in. x 10ft. 2in. provides an extremely large option for somebody looking for a quality piece at a reasonable price. hey, this is quite informative ! Beautiful rug! Any chance we'll be doing yoga on it?